According to a study by the Sentinel Project, genocide can be predicted. Christopher Tuckwood concludes in this study that the Iranian regime is making certain preparations in order to perform an act of genocide on Iranian Baha’is when the political order is given. The following text is based on the central statements made in a study by the Sentinel Project, in which it is convincingly put that certain factors make an act of genocide against the Baha’is probable. From the very beginning of its existence the members of the Baha’i faith were persecuted. Human rights were not respected prior to the Islamic Revolution, but since 1979 the human rights of Baha’is in Iran have been systematically violated. Growing economic hardship in society increases the probability of an act of genocide on Iranian Baha’is. When under pressure, the majority in society constantly seeks scapegoats to carry the blame for all problems. The majority society makes the minority responsible for its own misfortune, treating it with notable aggression. At the same time the majority in the population seeks security in radical and charismatic leaders, particularly when these promise to improve living conditions for the majority. They are mostly unemployed young people who show readiness to attack minorities. The official unemployment figures for Iran were only 12.5% for the year 2008 but the real figure is much higher; added to this is the aspect of low wages. Tuckwood lists the strong state apparatus as a further factor that makes genocide probable. The Iranian state controls the media and has police, military, paramilitary and secret service forces at its disposal. Such a system is capable of committing genocide without having to fear punitive measures. Furthermore, the Iranian regime is an ideologically motivated and revolutionary one, which pursues utopian visions that can prove very dangerous for minorities. Tuckwood rightfully points out that it is very difficult to determine whether the regime is in fact planning a genocidal extermination of the Baha’i community, but there are indeed sufficient documents available substantiating that the Baha’i community’s survivability to is to be prevented. State documents published in 1993 substantiate that the Iranian government wishes to ‘block’ the ‘progress and development’ of the Baha’i community. The Baha’is should not be allowed to study at universities and their religious activities should be suppressed. It was under the presidential term of Hashemi Rafsanjani that a secret document demanded “the destruction of their cultural roots abroad”. In late 2005 an order by the Iranian army to the Iranian police, the secret service and the Revolutionary Guards commanded the identification of all Iranian Baha’is. Although it was not directly demanded that the Baha’is be physically eliminated, they were clearly to be forced to give up their faith and convert to Islam. Currently the Iranian government attempts to assert its objectives of suffocating the Baha’i communities with ‘soft’ approaches, but tougher methods on the part of the dictatorship cannot be ruled out. The author of this study acts on the assumption that the persecution of the Iranian Baha’is will bear strong similarities to history’s well-known genocides. Firstly, the members of the Baha’i faith in Iran are not classified as a religious minority and therefore have no rights and receive no state protection. Secondly, the majority of Iranians have no personal experience with individual Baha’is and are influenced entirely by state propaganda. Facts like these play a significant role in the formation of stereotypes and in the dehumanisation of target groups, Tuckwood writes. Thirdly, the state and media hate-propaganda aiming to dehumanise the Baha’is is having an impact. The Baha’is are seen as heretics because they believe in a prophet who appeared after Mohammed. Furthermore, Baha’is are accused of working for foreign powers such as the USA and Israel. Baha’is suffer verbal abuse, being called ‘prostitutes’. They are said to be ‘incestuous’ and ‘filthy’. Tuckwood rightfully points out that it is easier for perpetrators to murder Baha’is when they have previously been dehumanised. At the same time, their dehumanisation encourages neutral observers to either become involved in the murders or to remain quiet. Point four: the Iranian state disposes of forces that make genocide entirely possible: the conventional army, the Revolutionary Guards, the police and the Basij militia. Since the Basij militia and the Ansare Hezbollah are under the command of state bodies but are not affiliated with them, they are able to carry out extensive violent acts against Baha’is. Incidentally, this is already happening: houses and buildings belonging to Baha’is are set on fire, cemeteries are destroyed or individuals arbitrarily arrested. Point five: the aim of the Iranian government is to separate the Baha’is from the rest of society. Any Iranian demanding that Baha’is and Moslems be treated equally is therefore accused of collaborating with foreign powers. Point six: the Iranian government has long since adopted steps to diminish the position of Baha’is in society. This is in preparation for a possible extermination of the community. Preparatory measures include exclusion from state bodies, restriction of their economic participation and exclusion from academic education. The author of the study assumes that the Iranian regime is determined to destroy the Baha’i community’s cultural survivability. In addition, the regime has the potential to physically eliminate the Baha’i community. While the regime has not yet undertaken such a step towards physical elimination, some factors point towards the fact that persecution is to be intensified or even a genocidal massacre be carried out. If the economic situation in Iran worsens, this can lead to an increase in social conflicts with the result that young unemployed people become even more radicalised, allowing themselves to become recruited by the Basij militia and thus developing even greater hostility towards Baha’is. Whenever the conservative powers feel particularly challenged, their crimes can become ever greater. The rulers can proceed even more aggressively if they become aware that soft means of ‘converting’ Baha’is to Islam have failed with the consequence that the physical elimination of the Baha’i community could be planned. With growing external threats the regime could feel pressured into eliminating what they perceive to be their internal enemies. A dilemma of this nature could become more likely if Israel or the USA were to stage a military attack on Iran. Indeed, the Baha’is are considered to be the ‘fifth column’ of these countries. Consequently, an increase in the danger of war likewise increases the danger of genocide. Domestic unrest and protest movements, whether from political rivals or ethnic minorities, can increase the danger of rulers intensifying their persecution of the Baha’is. Which Factors Point towards a Future Escalation? There are several factors that lead to genocide: the government attempts to block escape routes that the persecuted target group could use in order to travel abroad. The Baha’i community could become ghettoised, which would make mass arrest a simple affair. In the history of genocide, men and women were separated within communities. There is also the danger of Baha’i children being separated from their parents, since the aim of the regime to convert the Baha’i to Islam has failed. Separating children from their families could succeed in preventing growth in the community. The Iranian regime could deploy its military and paramilitary instruments in order to achieve its goals: army, Revolutionary Guards, police, Basij militia, Ansare Hezbollah or the Hojjatieh group. Finally, the study comes to the conclusion that no concrete systematic genocidal intentions on the part of the regime are at hand, but the intention to destroy the Baha’i faith is clear and further steps could be taken in this direction. The Iranian Baha’i community is poor, without leadership and without legal protection. As a consequence, the Iranian regime has already made numerous preparations to carry out an act of genocide on the Iranian Baha’i community, should the political order be issued. Furthermore, this phenomenon waiting for an order to commit genocide against Iranian Baha’is is reminiscent of Iran’s nuclear programme. Non other than Hans Rühle, from 1982 to 1988 leader of the planning committee in the German Federal Defence Ministry, made clear in an article that Iran wants to persist on the level of a ‘virtual power’ “so as to await a convenient global political opportunity in order to perform the last step”. 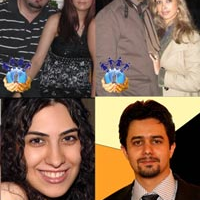 A judgement in the show trial against seven prominent Baha’is in Iran is expected on 11 July 2009. They are wrongly accused of “spying for Israel and the USA”. Evidence has not been provided to date. The Iranian Baha’is are persecuted solely due to their beliefs and values because they believe that Mohammed was not the last prophet. Payam Akhavan, a Canadian human rights professor who lectures at McGill University, fears that state repression could end in mass executions and in the torture of the leaders of the reform movement. Large-scale human rights violations committed by the state must be punished, just as President Slobodan Milosevic was punished. The United Nations must issue a statement that crimes against humanity will not go unpunished, says Professor for Human Rights Akhavan. Human Rights Professor and Canada’s former Minister of Justice Irwin Cotler is seeking prosecution for Ahmadinejad before an international criminal court. The Iranian rulers not only oppress Baha’is on a large scale; they also invoke hate and genocide against Jews. This makes them accomplices in crimes against humanity. The Iranian government must be held accountable. My uncle was executed in Iran when the Islamic Revolution occured because he was a prominent memeber of the baha’i community. I have an 84 year old family member still in Iran who is terrified about the hardening of the current regime. Why hs it been left to now it raise awareness of the appaling treatment of Baha’is in Iran? Surely Obama and the West mus make it one of the conditions to the Iranian regime when talking about nuclear weapons that Baha’is must NOT be discriminated against and ALL those arrested be freed. PLEASE do not leave it until they execute more people, soft words and sanctions are not enough. I wonder what the Universal House of Justice is waiting for organising and giving the order of evacuation of the Iranian Bahai Community? The commentators are understandably anxious regarding the current situation. The Baha’i’s in Iran are Iranian and love their country. I do not think that Baha’u’llah envisioned an Iran without Baha’i’s and the Universal House of Justice has recently written to the Iranian believers to let them know how important and needed they are for breaking down the barriers of prejudice in Iranian society and to care for those treated unjustly. Perhaps in order to transform Iran to the “source of the joy of all mankind” the Baha’i’s will have to sacrifice more before there is a change of heart of the people and the authorities in Iran to see that what they are doing is against religion and Islam. I think the people are now begining to see the truth but the authorities have yet to catch up. Have faith that the circle of justice is completed in the next life. Let us pray to God that the sacrifices of the innocent do not need to be greater than they already are. Funny how the regime and its agents wish for the Bahais to leave Iran!!!! Bahais are from all nationalities, races and religious background and are all over the world. All Bahais love Iran and know a day will come when hands of tyranny and supression will be cut out of this blessed land. Every night is followed by a day. And God works in mysterious ways. As a persian poem says : “Whoever tries to extinguish the fire ignited by God will burn himself in the process” . I wish those in power would study history more and learn from it. A study of the last 30 years of Iran has indicated that the Bahai Faith has become much stronger in the face of the suppression. My heart goes out to the Bahai’s of Iran and I totally agree that those involved i n their persecution should be brought to trial for injustice to humanity. I shall continue to pray especially for the 7 Bahai`s who are about to be brought to trial. God is in charge and we must continue to believe that and have faith. Don’t Just Stop Genocide — Prevent It Before It Starts!